Dramatic earrings flash with natural rose cut Tanzanites set in Palladium with 24K Gold shaped inlay. The top element with a tube-set Demantoid is hinged for greater movement. 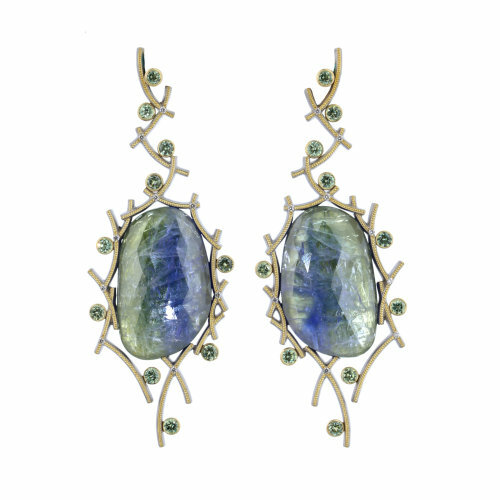 Dramatic earrings flash with natural rose cut Tanzanites (49.9 ct. total) set in Palladium with 24K Gold shaped inlay. 2.56 carats of Demantoid Garnets highlight the green in the Tanzanites and .18 carats of Diamonds top it off! 18K Gold friction backs and posts.